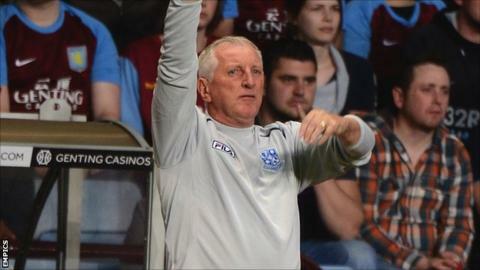 Ronnie Moore praised Tranmere for their second-half fightback as the League One leaders came from a goal down to beat Scunthorpe 3-1 on Tuesday. And there was redemption for Moore, who had unhappy memories of his last visit to Glanford Park with Tranmere in 2009. "It makes up for the last time I was here," Moore told BBC Radio Merseyside. "Last time I was here, I got the sack. I don't think that will be happening." Moore was dismissed after failing to reach the play-offs that season. But Tranmere have been in scintillating form since the 59-year-old returned to Prenton Park in March, and Rovers stretched their lead at the top of the table to four points with victory on Tuesday. Moore's side were 1-0 down at the interval, but a brace from Jean-Louis Akpa Akpro and a first goal of the campaign for captain James Wallace preserved Tranmere's unbeaten record in League One. "It was a pity he [Akpa Akpro] didn't get his hat-trick, but we've got three players now all on seven goals so it shows we're doing something right," added Moore. "We've got a fantastic game coming up now on Saturday [against fourth-placed Notts County]. "It will be a tough old game there because they're a good side, they move the ball well and it's a big pitch. "But if we play anything like we've played in the second half, I don't think there's anybody in this league that will live with us."